Oh, that book looks gorgeous! Some great patterns in there. I haven't been to London for yeears, but the next time I do go I'm definitely hunting down loop. From everything I've seen and heard about them it looks like such a lovely store! Those projects are all completely droolworthy---definitely a worth-it splurge, the book looks amazing. 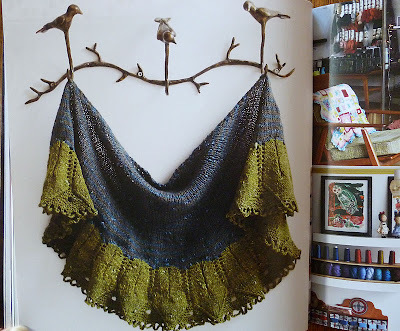 Especially that shawl---those ruffles look almost alive, I love it! Those finger-less gloves are AMAZING! drool...drool... If only I could knit that well. Someday! I have been eyeing this book for a while. Now I need to buy it! Those are gorgeous patterns that you have picked out. I especially love the shawl on the cover in the brown and cream colourway. Cinnamon Girl is so sweet and pretty. Have fun knitting from it!